PENCILLERS: Ryan Browne, Erik Evensen. Cover by Dan Schoening. 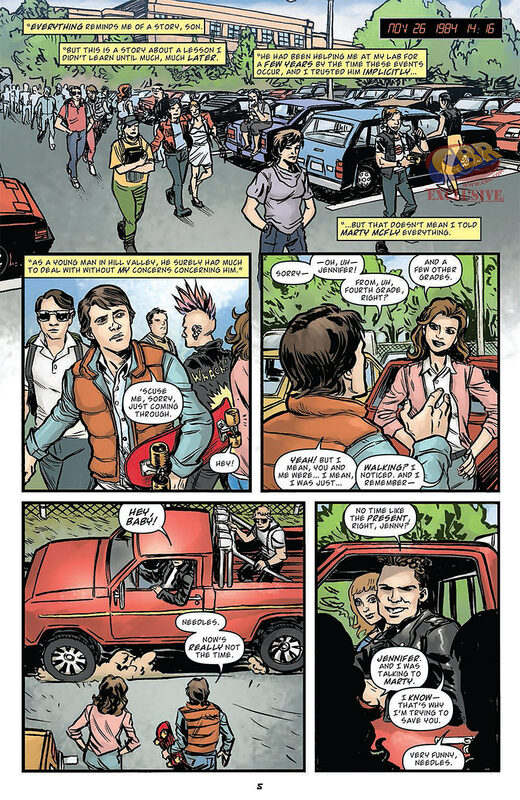 When you get right down to it, IDW’s Back to the Future series is about answering questions most people wouldn’t think to ask. For instance, in this issue we learn how Marty and Jennifer got together, and what Doc Brown did when he got to the year 2015. 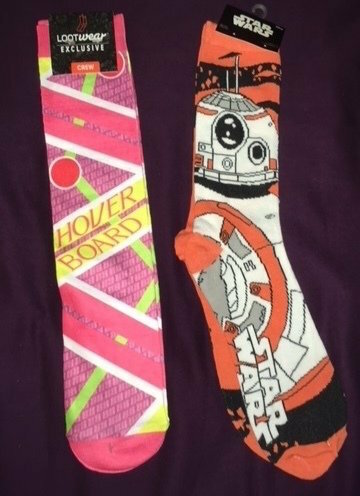 Still, if you’re a Back to the Future fan the answers are pretty cool. Our first story, “Peer Pressure,” takes place about a year before the events of the first film. We see how Marty got involved with Jennifer, and how both Doc and Needles factored into their romance blossoming. 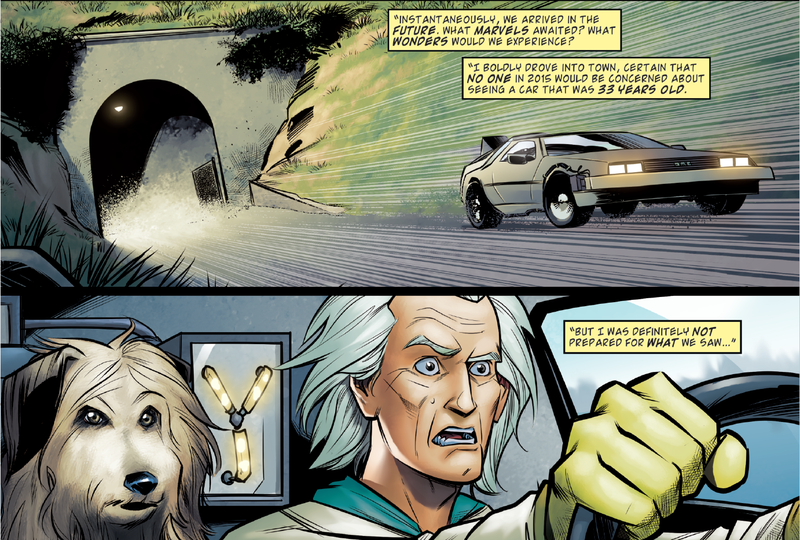 Then, in “Emmett Brown Visits the Future,” we pick up with Doc after he travels to 2015 for the first time. To say the very least, Doc is in a strange new world. But how does he grow accustomed to the future? 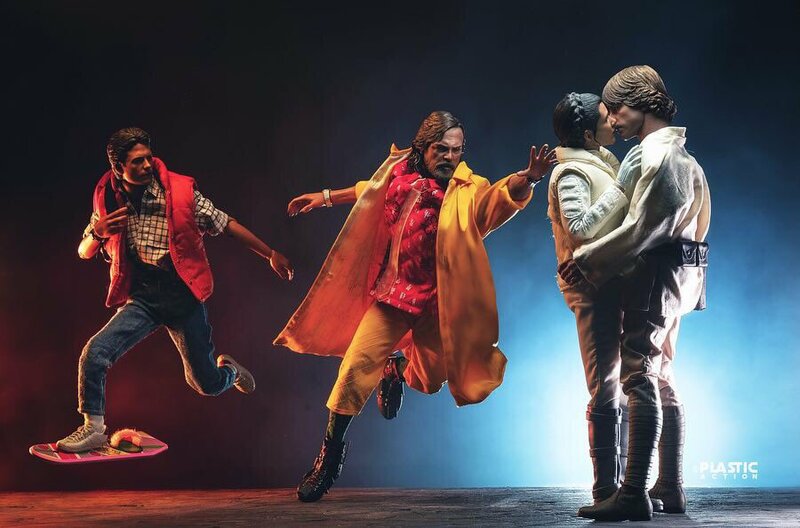 What does a time-traveling scientist from 1985 do for money in 2015? Chances are it’s not what you think it is. What this Back to the Future series has opened my eyes to more than anything is just how similar Marty and George McFly are. In the movies, particularly the original, Marty seemed like the black sheep of his bloodline. George was cowardly, and so was Marty Jr in Part II. While Marty did share George’s self consciousness about his creative outlet, he always seemed cool and confident. But as we see in “Peer Pressure,” before we met him in the first movie, he wasn’t so confident. He has a similar dynamic with Needles that his father had with Biff Tannen. But he has a father figure of sorts in Doc Brown, who helps him become the young man he is in 1985. I’m wondering how new this concept is. Was it created for the comic, or did Bob Gale and Robert Zebecks have it in the back of their minds as they were making the movies? It’s pretty logical, if you think about it. As far as we know, George didn’t have many (if any) friends when he was Marty’s age. It makes sense that having Doc in his life would make Marty braver and more outgoing than his father was. And as such, he wins Jennifer over. When I got to “Emmett Brown Visits the Future,” I wondered if this was actually an adaptation of the short film Doc Brown Saves the World from the series Blu-rays. Rather, it’s a simple look at what Doc did when he visited 2015 for the first time. This one has it’s tongue firmly planted in its cheek, but that’s fine. The resolution to Doc’s money problem is funny, but not necessarily worth the trip. It’s one of the few times this series has disappointed thus far. From an art standpoint, it’s pretty tough to beat Dan Schoening’s cover. His art is tailor made for a series like this. But I can only assume he’s busy with the upcoming Ghostbusters International, and I’d rather have him there. As for our artists here, they both have their strengths. Erik Evensen has a more of a sleek, clean style. But he also has less to work with in terms of character and story. Browne has most of the main characters, and Marty’s struggle is very relatable. So if we look at this as a competition, the edge goes to Browne by virtue of the subject matter. 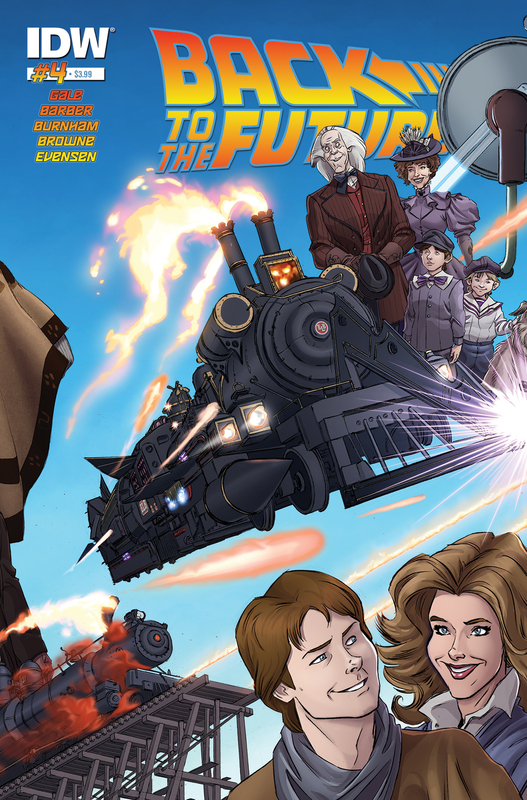 IDW’s Back to the Future was originally supposed to be a four-issue miniseries, but is now an ongoing title. Given what we’ve seen so far, I’m okay with that. They’ve got enough fertile ground to keep this going for at least a little while longer. I’m still waiting for our introduction to Marty from the alternate 1985. And how did Biff end up working for the McFlys? For children of the ’80s and ’90s, these kind of questions make Back to the Future a worthy pick-up. Image 1 from majorspoilers.com, Image 2 from bleedingcool.com. This entry was posted in Comic Books/Graphic Novels and tagged Back to the Future, Back to the Future #4 (IDW), Back to the Future Part II, Bob Gale, comic book reviews, Dan Schoening, Doc Brown Saves the World, Doctor Emmett Brown, Erik Burnham, Erik Evensen, IDW Publishing, John Barber, Marty McFly, Rob Siebert, Ryan Browne, single issue reviews on 01/20/2016 by primaryignition.